Just got off the phone with my builder and it appears that, like any new home in Newfoundland, the basement will come uninsulated. I considered getting the builder to insulate the basement for me, however, I'm attempting to become more handy. After attending a few Home Depot seminars, I'm pretty confident that I can tackle the project of insulating my own basement (famous last words?). 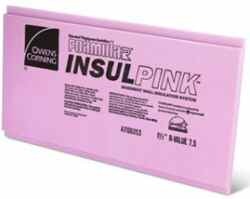 My new basement will be floor to ceiling concrete, so my plan is first cover my concrete walls with glued on 4'x8' (1" thick) sheets of Extruded polystyrene foam (pink stuff). After tuck taping all the seams, I plan to frame the walls with 2"x4"x8' plywood with 24" centers. After all the walls get framed, I plan to use pink fiberglass batt insulation (23.5" wide) to fill in the "centers". Oh one more thing, I plan to insulate the rim joists (portion of the basement ceiling joists that connects with the exterior wall) with cut to size fiberglass batts. Typically vapor barrier is needed on top of the batt insulation, but extruded (not expanded) polystyrene foam with tuck tape will act as the vapor barrier. If you're looking for a more information on the "how to", check out this article by The Family Handyman. The local power company (Newfoundland Power) offers a rebate if you do insulation type projects. I think it works out to be around 10% of your total cost. On top of that, you can sometimes get "contractor pricing" from the hardware stores if you buy enough stuff. Or, I can wait for the materials to go on sale. However, for the sake of simplicity, I won't account for these discounts yet. Judging from my last energy saving article, 25-30% of your heat can be lost through the basement. With the power bill being 60% heat, I would estimate that I will save 25% x 60% = 15% / month. Assuming that my power bill will be around $250/month (equal payment plan), I will save around $37.50 / month. With the cost of the project being around $1,926, it will take around 51 months or 4.28 years for the project to pay for itself. That's not including the added value to the property. That's phase 1 of my basement development! It might take a few years, but I plan to take it right to the end. Sorry about the painful details, I added them all so that when I do actually start the project, I have something to reference. Any handy people out there? What are your thoughts on this project? Seriously, it does not seem to be too complicated. Another thing is that beside the fact that you will save money, it is always good to have a fully finished basement. Having the insulation done is definitely the first step! How much would it cost to make your builder does it? Just watch the local building code for the height above floor that you have to stop the fiberglass batts. In Southern Ontario they want to see NO insulation or vapour barrier i nthe last 12-14 inches before topuching the floor. (Prevents water logging inside the wall) Is seems odd to have all this great insulation then just nothing at the bottom, but that is what the inspector wants….. Personally I think that finishing a basement is a good (but large) diy project for the simple reason that there isn’t much pressure to get it done since you won’t be using the space anyways. Make sure you set generous deadlines (if you set any). I’m skeptical about losing 25-30% of heat through the basement – doesn’t heat rise? FT…New homes do not qualify for the Newfoundland Power Rebate. I’ve been looking into it as I am building as well. FP: You would figure that heat rises, but check out this article from newfoundland power. I would think though for a house that is uninsulated (obviously not a new home) it would be better to start insulating from the top down. ie If you don’t have any insulation in the attic then the amount of insulation in the basement would be irrelevant. you might want to go ahead and get bids from the builder as well as an outside company so you’ll know how much you are saving by doing it yourself. I would guess it would come out to 3 times the DIY cost but would be interesting to know. If it would cost you 1 year of time to DIY but only 20% more than $1926 to have someone else do it, would be good to know that. And I know from working on cars that sometimes aggravation/emotional distress/profanity/apologies to random strangers has a cost as well:-), but maybe that’s just a personal line-item with me. Good luck with the project. One thing I would add is that you look into insulation on the ceiling that is also a sound insulator / absorber. It’s some times a bit of a hassle to run electrical lines after the insulation is in. Maybe consider running some wire for power outlets in generic locations? They don’t have to be connected to the breaker panel just yet. Running cables doesn’t require an electrician. That’s a good point nobleea. any power, internet, cable, speaker cables that you forsee putting into your basement is much cheaper to do before the insilation is installed rather than having to pull it all out again down the road. Keep in mind that it’s only your exterior walls so there shouldn’t be a whole lot of it to run. Good point Nob. I planned to put in basic sockets but later. However, it may be a good idea to just get it done while in the framing stage. Telly, the issue with insulating the basement ceiling is that if the basement is unheated, it will actually make the basement colder (it will insulate the cold). Strange that the local building code doesn’t require a builder to give some insulation in the basement. In Ontario, they have to give some low level (R15 I think) to a foot or two below grade. I’ve never heard of the requirement Mikel mentioned about stopping a foot above the floor – I’ve seen basements done and it’s always to the floor (well, 2 inches above since you’re putting it in the wooden wall framing). On your plan – it seems like overkill to glue sheets and then use batting over top – batting itself should provide ample insulation and can be placed directly against your concrete wall. You can use cheap and effective clear plastic vapour barrier and you should be all set. Ontario is fun because unlike out east, we have 2 different problems: keeping hot outside moisture away from your cool dry indoors in the summer, and then keeping the cold dry outdoor air away from the moister, warmer indoor air in the winter. Makes placement of the vapour barrier a challenge, and often homeowners end up with condensation in their insulation. Best way around it is to blow poly foam into the rim joists. but you shouldn’t have trouble with that, since the air is less humid in your area. It’s that humidity that kills us! Tom, i’ve heard that the blow foam stuff (like Mike Holmes uses) is extremely expensive. What are your thoughts on it? I was considering using it for the RIM joists as it’s much more convenient than adding vapour barrier in between EVERY joist. I had my builder do my basement and he used the polystyrene foam (pink stuff) cut to fit the rim joists and then caulked. TC, as the foam board is only R-5/1″, is that enough insulation for the rim joists? I guess it depends on the climate for the area. FT, It meets R-2000 standards as the home is R-2000. I am building in St. John’s. Keep in mind that the exterior of the house is also insulated with foam board under the siding and tyvek. I’ve only seen the finished product so you are right…there is likely batt insulation in there as well. I completed the same project several years ago. I completely removed my old existing rec room (from 1972) and started from scratch. I followed Manitoba Hydro’s Power Smart program. In the end I got 500 dollar rebate. The procedure I followed was the same as yours without the polystyrene panels. My basement is now insulated with R24 with 7 inch of fibreglass Instead of polystyrene panels. The wall is framed with a 3 1/2 space between the wall and the studs. One layer (R12) of fiberglass between the outside wall an the studs and another (R12) between each stud. In addition a vapour barrier is hung on the outside wall (starting 4 inches above grade) and another a standard vapour barrier on the surface of the wall. Not sure what your total R value will be but doing it will cost a few hundred less and give you R24. It can get pretty cold here in Manitoba and I have been very happy with the results. Is there any requirement to fireguard the walls that contain foam, or is the fiberglas insulation enough? Your materials list does not include vapour barrier or wall board of any kind, but you might need to factor that into your costs. Should you choose to use fiberglas only, then the fire protection would not be necessary. We had the blown foam insulation sprayed in our house – it comes in two separate canisters and forms as the two liquids combine. The cost is pretty high – just for the rim joists it came to $14 per linear foot. But it’s about the best insulation you can buy, and it seals great. The problem we had was that in the summer hot humid air would get in via the rim joists, condense against the top plate bolts (the bolts that hold that strip of lumber to the top of your foundation), and then the condensation would collect and drip down the wall into the insulation. Not nice. But the fix worked great – this summer, not a hint of condensation, so we can now feel comfortable finishing the basement. Our ‘interesting’ neighbours all have the same problem – one of them had all his exterior windows re-caulked thinking that was the problem – the only thing was – the moisture was along the entire wall – not just under the windows! One question – you said you were finishing the walls with plywood? Can I ask why not drywall? That gives you a nice finished wall surface..
Tom, interesting point about the blown in insulation and condensation. How did you fix it? And yes, I will be using gyproc to finish in the future, the wood listed above is for the framing. Hi FT. It has been a while sense I have stopped by your site. Great to see you are still pumping out valuable content and it appears your audience is really growing. Great stuff! I am going through the exact same process right now. We still have half of our basement undeveloped. We received a bunch of quotes on the materials. Kents came in the lowest for the studs – $2.69 per. Another thing you might want to consider doing is putting in a sub floor. I am also in the process of building. I have some building experience and will also be insulating and finishing my basement. I have projected costs for finishing the basement myself and you definitely save thousands not only from the labor side but also from energy costs projected over the life of the house. If at all possible one should always consider insulating under the slab of your house. One of the biggest mistakes people make is to not spend the $700 on insulation to insulate under the slab. Most people insulate on top there by losing thermal mass which acts as an effective temperature moderator for basements. With the slab insulated underneath one can overpour self leveler and place radiant heating cables for really cost effective heating. In regards to the extruded polystyrene…make sure you weigh the cost and benefit of this system. Extruded foam often looses R-value over time unlike the expanded stuff. The expanded stuff can also be used just erect a vapor barrier over the foam before the stud wall. make sure not to put another vapor barrier over the batt insulation as you will create a bubble between the studs where water vapor will sit and cause mold to grow on wood studs. Anyway, I am no expert on building but I am a physicist and I have studied thermodynamics and fluid mechanics. Air infiltration and vapor control are all complex physical processes. The dynamics of moisture infiltration in basements is quite complicated and controlling it is an uphill battle. here’s an artile you may find useful. Thanks for all the details Djg. I had no idea that the extruded polystyrene actually loses R value over time. Perhaps i’ll look into using the expanded stuff with vapour barrier. Might actually cost a little less. Nice thread but a few years old. We insulated on the outside of our foundation when replacing the weeping tile. we used sprayfoam, initially envirofoam and later used walltite upstairs and part of downstairs. it cost roughly $3 a sq ft for 2 inches, the amount the recommend to be a vapour barrier; they claim r7 and inch but it might settle closer to r6 an inch. you could feel that the uninsulated furnace room was warmer on the part insulated the day before and cooler on the part done after that. a national research canada study suggested similar spray insulation was effective insulation and could last some years. it is water resistant or better. it should seal the small cracks in the foundation (unless the foundation movest too much). In winter the basement needs much less heat than upstairs, in part due to the insulation and in part due to larger windows upstairs and more exposure to cold winds. the same spray insulation covered the joist ends on the outside but then has to be covered with stucco or something else. good luck with your insulating. I know this is from 2007 so there have been a few changes since then. The NBC from 2010 and beyond, requires a conditioned basement/crawl space to be insulated. That is, if you have a heated area with HRV ducts, etc., the space MUST be insulated. It was common practice in my part of the province, central NL, for “finished” homes to have un-insulated basements upon occupancy, this is not the case now. At the minimum, a basement must have insulation and in the case of foam, be covered with gypsum. This is also the case with ICF foundations, which are very popular here. In the case of a regular poured concrete foundation, if the aforementioned foam is not used, it will be insulated with fibreglass batt/studs AND 6 mil poly. Believe it or not, the poly provides a flame spread rating of less than 150 which is required for occupancy.